Normal: Oil is distributed evenly and there is no shine on the face. After you cleanse your face, your skin doesn't look dry or oily. Acne breakouts are less frequent. Oily: Skin that appears shiny or greasy up to two or three hours after your cleanse it. Excess oil contributes to enlarged pores, blackheads and blemishes. Dry: Your skin feels dry and tight and possibly itchy after you clean your face. 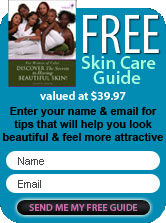 Your skin also will have the appearance of flakiness which might appear ashy. Combination: A blend of oily and dry skin types, with blemishes and skin irritations frequenting the T-zone area. Oiliness can appear to be more prevalent on the forehead and nose while your nose and cheeks are flaky and dry.